Three fishing mates. Ten epic adventures. 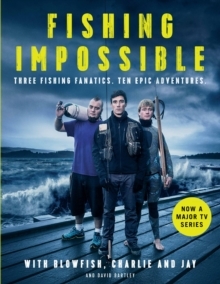 Charlie, Jay and Blowfish are three obsessive fishing buddies, each with their own area of expertise. Hatching plans for the weirdest, most extreme fishing trips imaginable, they head to ten fantastic destinations around the world. From spear-fishing in the Bahamas to bungee jumping in British Columbia, and dodging crocodiles in Kenya, their mission is to catch the uncatchable in the most entertaining and bizarre ways possible. These immersive, adrenalin-fuelled trips of a lifetime are ones most fisherman have only dreamed of, with responsible, environmental considerations at their core. Join the three mates as they head around the world to see marine life at its most exotic and extraordinary.